The world in his hands Hear from Nathan Brown and Jarryd Blair as they pay tribute to their close friend Brent Macaffer following his elevation into Collingwood's leadership group. The retiring Brent Macaffer leaves his last Copeland Trophy as a winner of both the Darren Millane Award and the Joseph Wren Trophy. The mere mention of Darren Millane’s name carries significant weight in Collingwood circles. The Magpies’ Best Clubman Award is named in his honour, and remains one of the most coveted trophies a player can be bestowed. It is fitting, then, that it is Brent Macaffer who receives the award for 2016. Macaffer played just four senior games this year, but his influence far outreached the hallowed turf on a Saturday afternoon. Voted into the club’s leadership group during the pre-season, Macaffer’s warm and caring demeanour meant he was a tremendous source of support for his teammates and coaches. He poured his heart and soul into the VFL campaign, playing 17 games and ranking second for disposals, tackles and clearances. 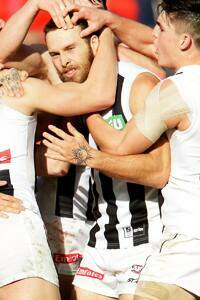 His pride and love for the Black and White jumper was etched on Macaffer’s face as he led the VFL Magpies from the ground in tears after bowing out in the Preliminary Final against Footscray. “Brent’s levels of professionalism and his drive and motivation has meant every element of his football has improved,” teammate Jarryd Blair says. “His leadership is developing as he gets older,” notes Nathan Brown, a past winner of the Darren Millane Award himself. “There are only a certain amount of guys who can demand his sort of aura. He doesn’t say a lot but when he does, people’s ears prick up and listen. “He’s very smart and has a very good footy head. When he says something you know you need to listen to it because more often than not it’s something very important for the success of the team. He has developed into a great person and a person that he should be proud of. “Caff’s resilience and development as a person is how he got from where he was into the leadership this year, which was on back of 2015, when he didn’t even play a game, which just proves how strong his leadership is off the field. “I remember early on in our first year (2007), Mick Malthouse said to him, out of all the people in the team meeting, ‘Caff, you’ve got the world in your hands! You can do anything with your talent,’ and that pretty much sums him up.